Cook pasta according to package instructions until al dente. Drain; set aside. Butter a 2-quart casserole dish or 6 small, individual casserole dishes. Melt 2 tablespoons butter in a small skillet. Add the breadcrumbs and cook over medium heat until toasted and fragrant (about a minute). Be careful not to scorch the breadcrumbs. Set aside. In large skillet over medium heat, melt 8 tablespoons butter. When melted and frothy, add the flour, whisking constantly until smooth and slightly thick (about 2 minutes). Reduce heat to medium-low and SLOWLY add the milk and half/half, a little (about a 1/2 cup) at a time, whisking constantly as you go. Once all the milk has been integrated, continue to cook and stir for about 3 – 5 minutes, or until thickened and the first bubbles appear. Add the seasonings and truffle oil (if using) and stir well. Turn off the heat and, using a wooden spoon, immediately add the cheese, and stir until smooth and well blended. Remove sauce from the heat and add the pasta, tossing to coat well. Transfer the pasta mixture into the prepared casserole dish(es). Sprinkle the breadcrumbs evenly over the pasta. Bake uncovered for 15 – 20 minutes or until bubbly. 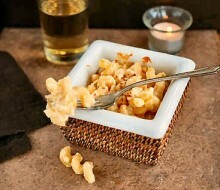 I plan to make your three cheese mac and cheese this Sunday apres ski with some friends from back in the hood. I plan to add dungeness crab and serve with a egg mustard dressed spinach salad. Any thoughts or ideas? I think the addition of crab will be great! I would just fold the crab in before baking. The spinach salad will be a perfect side dish for the macaroni and cheese. Since it can be a little rich, something “green” will be very good at its side. Enjoy!